Jeff Who Lives at Home DVD Review Jeff Who Lives at Home is, like its central character, simple, sweet-hearted and a little bit slow. It’s also somewhat difficult to warm to, no matter how good its intentions. The latest directorial outing from mumblecore poster boys Jay and Mark Duplass and the follow-up to their excellent 2010 John C. Reilly/Jonah Hill vehicle Cyrus, Jeff Who Lives at Home is another well-intentioned and quintessentially indie addition to their burgeoning DIY canon. Unemployed 30-year-old stoner Jeff (Jason Segal) is fond of many things: ruminating, penning thoughtful missives in his journal, analysing the movie Signs for hidden messages; in fact, pretty much anything that doesn’t require him to get off the couch. After receiving a mysterious telephone call in which someone repeatedly asks for ‘Kevin,’ Jeff rouses himself to action. Ostensibly heading to the hardware store on an errand for his mother (Susan Sarandon), he looks for clues as to the significance of his ‘Kevin’ phone call, and in the process forges a long-overdue with his estranged older brother (Ed Helms) who disdains both Jeff’s lifestyle and his errant flights of pothead whimsy. Criticising this film feels about as mean-spirited as picking on a retarded kid. It was obviously shot on a modest budget and the Brothers Duplass are by now experts at putting together a sophisticated looking indie flick on a shoestring. But when a film runs 80 minutes and still feels like it meanders around its central themes that probably isn’t the best sign, and although the writer-director tag team have once more assembled a stellar cast it’s only really Sarandon who shines. Jason Segal isn’t allowed enough freedom to display the wit or charm that have been so abundantly apparent on previous films like Forgetting Sarah Marshall and I Love You Man, coming across more as a stoned doofus instead of the quirky oddball that was intended, and apart from the addition of a goatee Ed Helms could be showing up to work in The Office, failing to really lose himself in his (fairly stock) character like he did in Cedar Rapids or The Hangover. 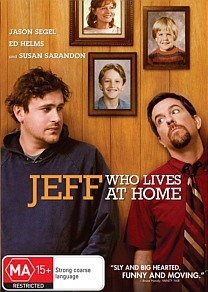 Jeff Who Lives at Home is, like its central character, simple, sweet-hearted and a little bit slow. It’s also somewhat difficult to warm to, no matter how good its intentions.